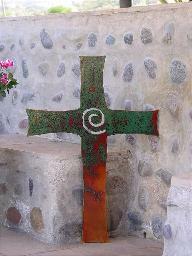 This southwest style cross with spiral exemplifies the best in southwest metal wall art ... the cross. This symbol tells the story of how Christian doctrine clashed with the beliefs of Native America and combined. The cross is the union of these two cultures, pointing to two very different ideas: the native concept of the four directions and the crucification of Christ. The spiral in the middle reminds us of the Creator's hand in everything. Nothing is more symbolic of the history of the southwest than the cross and the four directions. This beautiful piece of southwest metal wall art - the mission cross - is made of steel and cut and finished by our artists. Shown above in the rustina finish (greens and browns), but is also available in rust (brown), blue heat (blues and browns) and patina (light green, copper and browns). Comes ready to hang on the wall.